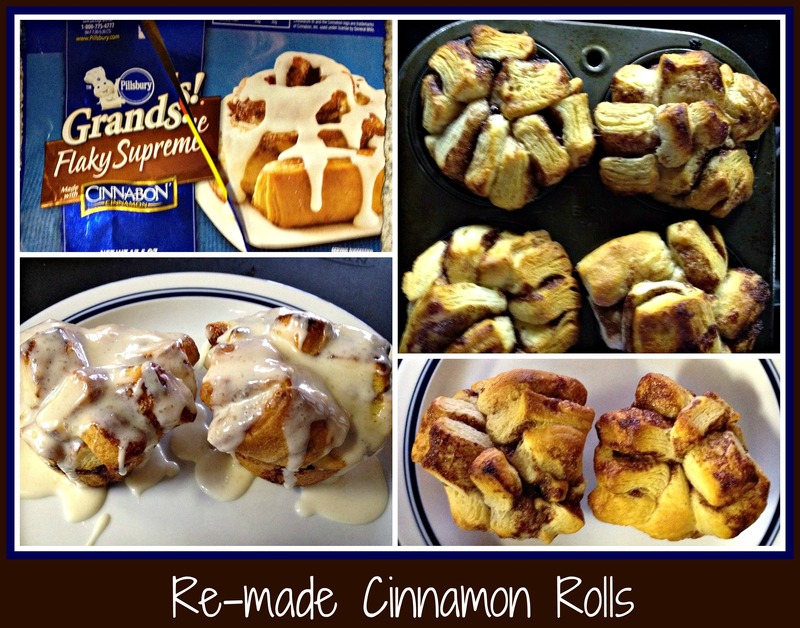 I love to pick up a package of pre-made Cinnamon Rolls and turn them into something a little different. Turning something that’s already fairly “perfect” and changing things up can be a lot of fun and give you a whole new perspective on an old tradition. Here’s what I did this morning with our breakfast. I started with a standard package of cinnamon rolls. Any brand works well – this one just happened to be a huge package that was supposed to make only 5 rolls. Great idea, but there are two of us and I didn’t really feel like picking up an entire roll to eat it. I know that sounds goofy, but I really like using a fork to eat things like this so I can eat them in little pieces and not get my fingers dirty. Girly girl… right? Anyway, I had thought about baking the rolls in traditional muffin tins, but they just didn’t fit… too darn big! At this point, I’d already sprayed the muffin tins with baking spray, so I really wanted to use them. Instead of just cramming them into 5 of the muffin tins, I sliced each large roll three times (creating 6 rolls sections) and divided them equally into the 6 muffin tins. Once they were all fairly even (it really did make 6 muffins this way, which is much simpler math than 5 divided by 2. I popped the pan into a 350 degree oven for 20 minutes and set about playing with the icing that came with the cinnamon rolls. IMHO (in my humble opinion), there’s never enough icing in these packages. I’m sure there’s enough for “normal people”, but we really love icing, so I always plan using The Force on this part of most pre-packaged breakfast foods. I started with the icing that came with the rolls and added 1/4 cup confectioner’s sugar, some Blue Bee Apple Juice, and a wedge of Laughing Cow light swiss cheese wedge (tastes like cream cheese to me). I whisked all this together and added a little more confectioner’s sugar to get the consistency I wanted. Remember, I use The Force when I cook, so this is always the way I make icing. I start with something and then just keep adding things until it turns out the way I want (or close enough that it’ll work). As you can see by the photo, there was plenty of icing and it really did taste amazing. The apple juice from Blue Bee was a great addition – I could also have used a light white wine (and have on occasion) but the apple juice was a great touch. Totally unique twist on an already yummy product… and a fun way to let me stretch a “single serve” item into something we could have used for 3 or 4 people. Yea! Have a great time playing with your food! I made a great steak sauce the other night… one that took my slices of steak from “tasty” to “wow” in such a short amount of time that even I was impressed. I wanted to come up with something that would bump up the flavor of dinner and, while my non-wine loving guys were unimpressed, I thought it turned out really well. I heated some olive oil in a saute pan, then added in some thinly sliced onions and let them cook for a good half hour, stirring occasionally. There’s really no shortcut to caramelizing onions – time and low heat are needed to get that toasty sweet taste from an onion – but it is entirely worth the effort. I started the sauce as soon as I walked in the door from work and made that the focus of the meal, time-wise. I still had dinner on the table within 40 minutes, but it was the sauce that needed the brunt of cooking time and attention. While this is an incredibly easy sauce, it’s not going to be quick. Once the onions hit that “toasty/caramelized” stage, I poured in some Merlot from James River Cellars Winery. I was using The Force for this recipe, so amounts were going to be approximations no matter how much sauce I was making. You might be able to tell by the pictures that I only used one onion and about a cup of wine… if you’re making this for a group of wine lovers, I would definitely increase everything for this recipe. Once the wine was reduced to an acceptable thickness (by about 60% or so), I added a pat of butter to “gloss the sauce”, so to speak. This bit of fat contributed a shininess to the visual presentation of the sauce on my steak and I later went back and topped some of my roasted potatoes and steamed broccoli with sauce as well. Since I was the only one sampling, I had enough to spread throughout my dinner and, wow, was it ever tasty. 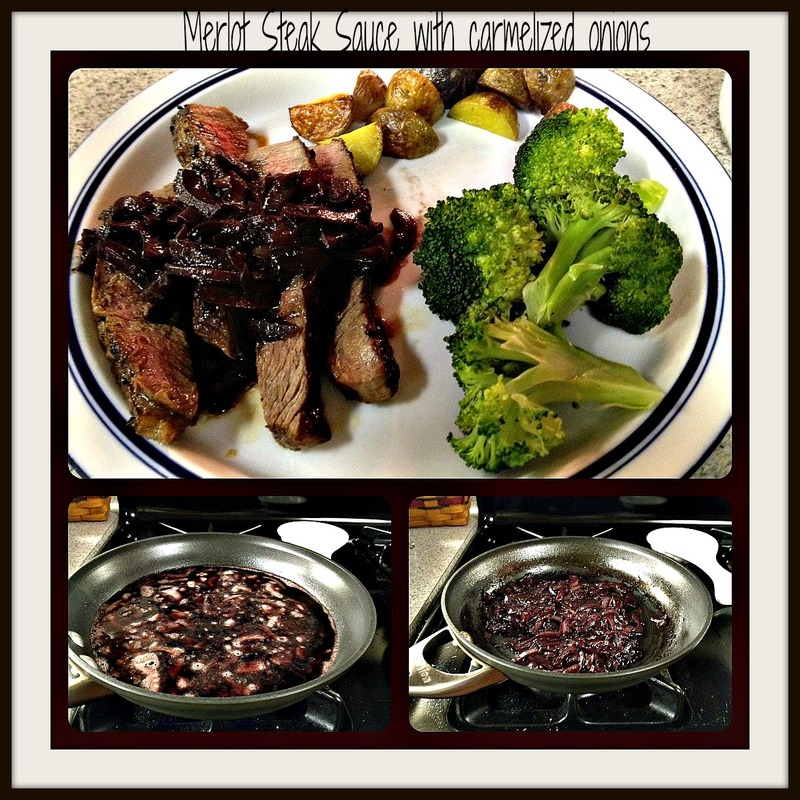 Whoever said that a sauce for your steak wouldn’t make other foods taste good as well was (IMHO) nuts! Easy, simple sauce… that’s what I was hoping to create, and that’s what I got. As I said earlier, it did take time, but the effort was truly minimal for the amount of flavor that I gained. Feel free to mix up some of the ingredients in this recipe to cater to the favorites in your own family. You could easily replace the onions with mushrooms… swap out the Merlot for a Cabernet Franc or Cabernet Sauvignon… this is a basic recipe, meant to allow you to tailor flavors to your preferences. Have fun playing with your food… that’s what makes cooking so enjoyable! This is one of those “O M G” recipes for those of you who like a creamy rice dish. It’s got flavor and just enough texture… it’s decadent yet simple enough to make for a quick dinner… and it’s got lots of ingredients that can be flipped around to suit almost any finicky guest. Even better, it’s based on a recipe that my boss uses at her house! It became a staple in her house after her trip to Rome… it’s going to become a staple in my own house because it’s just so darn tasty. You’ll have to try it and see what YOU think. In a large skillet, heat 2T olive oil over low heat, then add onions. Allow to slowly cook for 20-25 minutes, stirring occasionally, until onions are caramelized. If you’re using mushrooms in any form, this is where you’re going to cook them. While onions are cooking, heat remaining 2T olive oil in a large saucepan (don’t use something too small!). Add garlic and cook until fragrant. Add rice, tossing to coat in the oil, and allow to toast for 3-5 minutes, stirring occasionally. Add in wine, stirring occasionally. Once the wine is absorbed, add in 1 cup of stock and allow the rice to absorb the stock as it did with the wine. Repeat this 2 more times until all the stock has been added and absorbed. I didn’t stir this constantly – I didn’t feel it was necessary. I kept an eye on it and then tasted the rice when all the liquid was absorbed – if you like a softer consistency, feel free to add another cup of stock to the rice and stir as before. Reduce the heat to low and add salt/pepper, goat cheese and onions, then stir. I like the cheese to be thoroughly incorporated before I serve it, so I don’t top each serving with bits of cheese, but feel free if that’s what you prefer. You’ll notice that this post looks like an actual recipe… because I started with an actual recipe. I’ve added tons of places where you can alter things to fit your preferences, but this is your starting point. If you want to add some protein, feel free! There’s no “RISOTTO POLICE” who will come and tell you that you’re doing things wrong. As with any recipe where I use The Force to create a new rendition, feel free to make your own changes. The idea is to help you think outside the box and come up with a dish that will become a favorite at your house. After all… don’t you think the famous chefs took some inspiration from the food they ate when they were out? It’s scary, but try it every once in awhile. You might create a new “famous” recipe too!